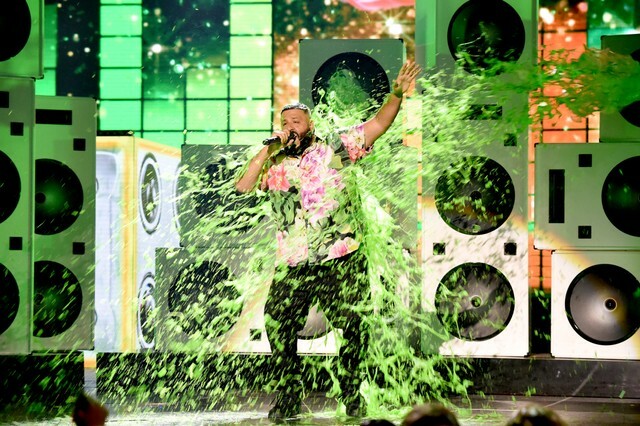 DJ Khaled was the host of Nickelodeon’s long-running Kids’ Choice Awards last night in Los Angeles. At the close of the night, the “All I Do Is Win” hitmaker shouted to the crowd to get loud and give a standing ovation, prompting gallons of the network’s classic electric-green slime to douse the producer from cannons hidden in speakers to his back. “Another one! We Out! Good night! Father of Asahd! May 17!” he shouted into the crowd. Father of Asahd, Khaled’s 12th studio album, was officially announced on Friday with an Instagram clip of the producer lounging in the tropics with a cigar, beach towel, and swim trunks. Like other DJ Khaled releases, the album is rumored to feature wealth of guest appearances from artists like Chris Brown, Big Sean, J Balvin, Meek Mill, Post Malone, Travis Scott, Bryson Tiller, 2 Chainz, Cardi B, and more. Watch his Kids’ Choice Awards slimming, as well his Instagram album teaser, below. MAKING FATHER OF ASAHD ALBUM, I MADE SURE I WENT TO MY ROOTS THAT MADE ME THE MAN I AM NOW ! CLIMB THE HOLY MOUNTAIN WIT ME FATHER OF ASAHD MAY 17 ! ITS ALL IN GOD AND ASAHD HANDS @wethebestmusic @rocnation @epicrecords ITS COMING ITS CLOSE ITS NEAR ! MAY 17 !